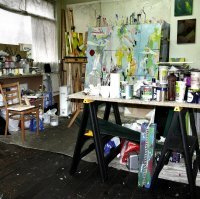 This collection of five studios is sited in the old Maurice Press printworks, located close to the Wembley IKEA on the North Circular road. A short walk from Neasden Tube (Jubilee line) and with a car park situated just behind the building, this location is extremely convenient. Included is power (fair use), hot & cold running water and toilet. Four of the studios share the old printing hall on the ground floor. The two front Window Studios have great natural light, diffused through a translucent privacy filter on the large windows. The Back studios are slightly smaller and suited to a smaller budget. 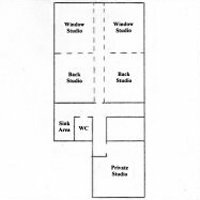 The Private studio is also on the ground floor but is separated in its own quiet space at the back of the building.